This is the perfect treat for such a grey, dreary morning. Sweet and comforting with just a hint of Island flavour to remind you of days spent on the beach. They are very easy to make and the end result is quite a dense little cake which hasn’t lost it’s moisture. If you can, use the Coconut Flakes from Woolworths. They just give another dimension to the cupcake, dessicated should be fine but I just prefer the flakes. Preheat the oven to 180°C. Line two standard 12-cup muffin pans with paper liners; set aside. In the clean bowl of an electric mixer fitted with the whisk attachment, beat egg whites on low speed until foamy. With mixer running, gradually add remaining 1/4 cup sugar; beat on high speed until stiff, glossy peaks form, about 4 minutes. Do not overbeat. Gently fold a third of the egg-white mixture into the butter-flour mixture until combined. Gently fold in remaining egg-white mixture; stir in dessicated coconut. Divide batter evenly among the muffin cups, filling each with a heaping 1/4 cup batter. Bake, rotating pans halfway through, until the cupcakes are golden brown and a cake tester inserted in the center of a cupcake comes out clean, 20 to 25 minutes. Transfer pans to a wire rack. Invert cupcakes onto rack; then reinvert and let cool completely, top sides up. For the Frosting, beat the butter and sugar together until pale and fluffy. Add the Coconut milk slowly until desired consistency is reached. Frost cupcakes with seven minute frosting, swirling to cover. 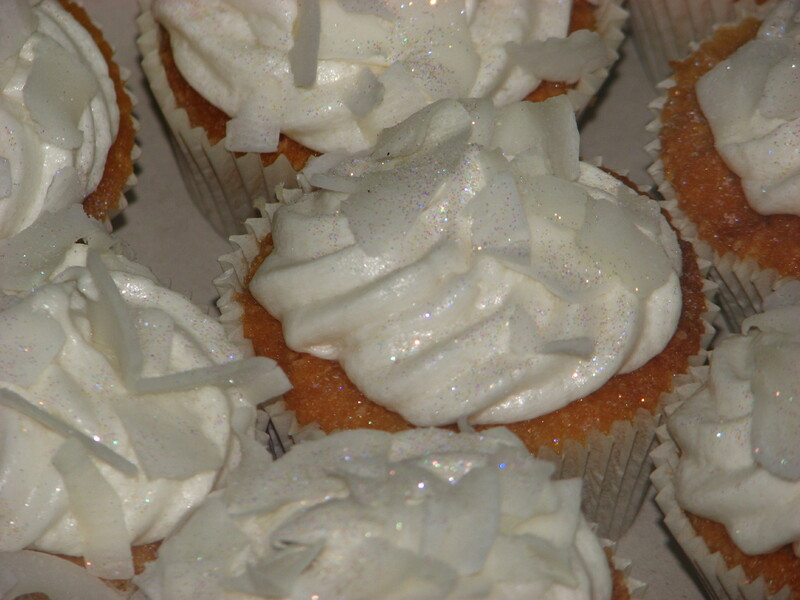 Cupcakes may be stored in a covered container in the refrigerator for up to 3 days. Garnish with fresh coconut just before serving.